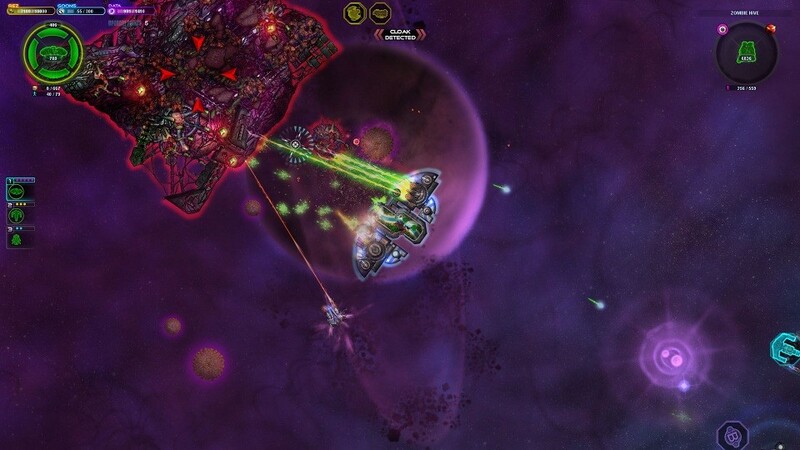 Space Pirates and Zombies calls up memories of games like Star Control. You explore a procedurally generated galaxy filled with life, blasting anything you want into floating debris. 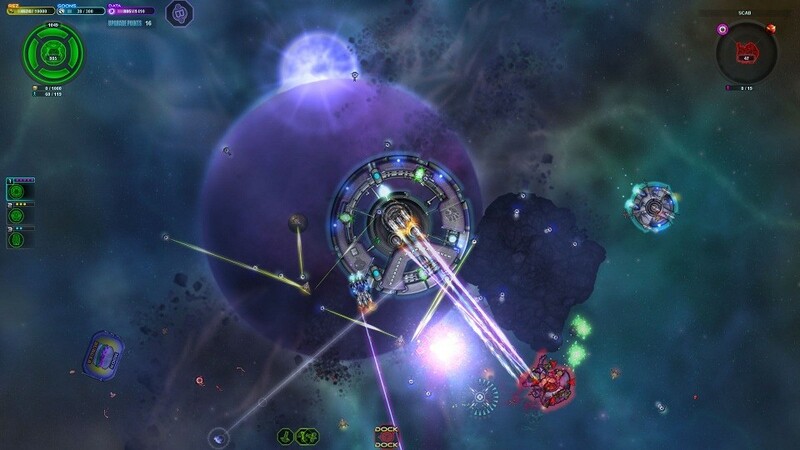 It strikes a good balance between tactical and arcade game play, and does a magnificent job of presenting a galaxy that feels alive. One example of this is the completely random content in systems without specific missions or events. Sometimes you will warp in and find an asteroid field littered with resources, other times you will warp into the midst of battle. Life goes on even when you aren't present to observe it. You start with a very small fleet of ships and a quest to reach the center of the galaxy. You directly control your ships one at a time, but can give very basic commands to the other ships in your fleet. Ultimately, battles will hinge on your skills as a pilot more than as a commander. You have what amounts to two forms of currency, rez and goons, which you can collect from missions for the various factions and characters you meet throughout the game. You can also do things like hanging around hotels or mining outposts, and scavenge what you need. The flexibility in resource collection is pretty nice. A lot of the time I would just run blockades guarding the warp gates in the general direction I wanted to go and pick up what I needed as I went. You will meet only a few factions in the game, but they are not in communication with each other, so souring the relation with a faction in your current system will not affect relations in any other system. The disconnect between the various systems in the galaxy feels very contrived at times, but it allows you more tactical freedom. The physics are surprisingly detailed. Projectiles will glance off your ship at high angles. Explosions will push you around. The weightlessness of space is portrayed well. The story is a little thin, but it's mostly a vehicle to keep pushing you through the game, so it's a minor annoyance. The voice acting by Totalbiscuit was fun. I have seen people complain that it is bland, but, considering the game's universe, I feel it adds to the atmosphere of the game perfectly. The graphics are not ground breaking by any means, but there is great attention to detail, and the amount of ambiance floating behind you is incredible. The humor is a constant treat. The random broadcasts; the quips of "rescued" goons in space; the description of ships and modules; and even the holiday mods the developer's created, all add to the fun and quirky feel. With 33 ships to collect and 70 unique components to add to them, there is endless variability in what ships you can design. You can hunt down specific technologies to make an agile brawler, or a clunky ranged missile launcher. It's all up to you. There is a definite feeling of grinding for resources and technology, but if you are like me you won't notice too often. After all, there's nothing more satisfying than punching through an enemy fleet with a ship custom fitted to you, and with a new galaxy generated for each play through replay value will not be an issue.